Learn how to build interactive decision trees using Zingtree's tools. The Zingtree Visual Designer lets you draw your decision tree. You can drag new nodes into the drawing area, and connect them with labeled arrows. The nodes correspond to pages in your tree, and the arrows are the button choices from each node. 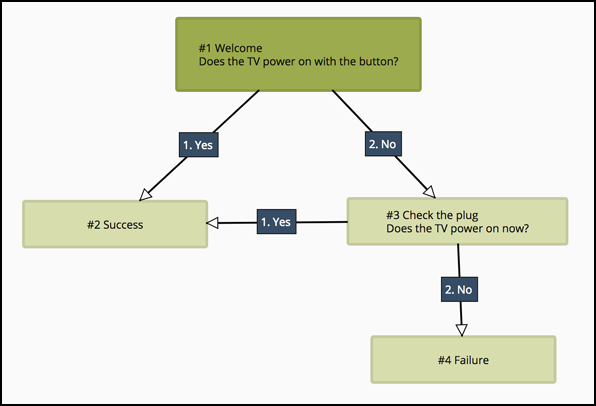 Once you're done, you've created a working interactive decision tree! The Zingtree Overview tool is the best way to maintain and tweak your tree, in a forms-based manner. You can also create new trees from scratch. See how to get handy reports and analytics from Zingtree.